سلمانیان, ذوالفقار, عیسی‌ زاده, آیاز, اسدزاده, احمد. (1395). تخصیص پویای پهنای باند اینترنتی کاربران با بکارگیری تکنیک AHP فازی. مجله علمی-پژوهشی رایانش نرم و فناوری اطلاعات, 5(2), 19-27. 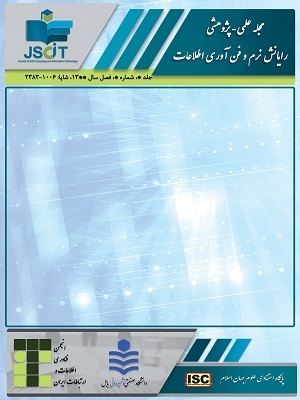 ذوالفقار سلمانیان; آیاز عیسی‌ زاده; احمد اسدزاده. "تخصیص پویای پهنای باند اینترنتی کاربران با بکارگیری تکنیک AHP فازی". مجله علمی-پژوهشی رایانش نرم و فناوری اطلاعات, 5, 2, 1395, 19-27. سلمانیان, ذوالفقار, عیسی‌ زاده, آیاز, اسدزاده, احمد. (1395). 'تخصیص پویای پهنای باند اینترنتی کاربران با بکارگیری تکنیک AHP فازی', مجله علمی-پژوهشی رایانش نرم و فناوری اطلاعات, 5(2), pp. 19-27. سلمانیان, ذوالفقار, عیسی‌ زاده, آیاز, اسدزاده, احمد. تخصیص پویای پهنای باند اینترنتی کاربران با بکارگیری تکنیک AHP فازی. مجله علمی-پژوهشی رایانش نرم و فناوری اطلاعات, 1395; 5(2): 19-27. برای توزیع پهنای باند در شبکه‌های کامپیوتری روش‌های مختلفی مرتبط با سیاست‌های تخصیص مدیران شبکه در سامانه‌های کنترل پهنای باند بکار گرفته می‌شود. با توجه به تنوع کاربران و میزان استفاده هر کاربر، تعیین پهنای باند متناسب با نیاز هر کاربر در شرایط مختلف در کارایی سیستم و استفاده از سیستم‌های مدیریت پهنای باند نقش مهمی دارد. در این مقاله روشی پویا و متوازن بنام تخصیص وزنی نرمال جهت تعیین میزان پهنای باند متعلق به هر کاربر با در نظر گرفتن میزان اهمیت وی نسبت به دیگر کاربران آنلاین همزمان ارایه می‌گردد. در این راستا برای به دست آوردن اوزان کاربران به عنوان میزان اهمیت آنها، تکنیک AHP فازی را بکار برده و نظرات غیر قطعی خبرگان مبنای استخراج این اوزان قرار داده می‌شود. سهولت پیاده‌سازی و امکان استفاده بیشینه از پهنای باند موجود از خصوصیات روش پیشنهادی می‌باشد. B. Hubert, Linux Advanced Routing & Traffic Control HOWTO, Netherlabs BV, 2002. D. G. Balan and D. A. Potorac, "Linux HTB Queuing Discipline Implementations," in Networked Digital Technologies, 2009. NDT '09. First International Conference on, Ostrava, 2009. ‎M. Devera, "HTB Home," December 2003. [Online]. Available: http://luxik.cdi.cz/~devik/qos/htb/index.htm. M. Devera, "Hierachical token bucket theory," May 2002. [Online]. Available: http://luxik.cdi. cz/~devik/qos/htb/manual/theory.htm. L. Balliache, "HTB queuing discipline," August 2003. [Online]. Available: http://opalsoft.net/ qos/DS.htm. B. ‎Hubert, T. ‎Graf, G. ‎Maxwell, R. ‎Mook, M. ‎Oosterhout, P. ‎Schroeder, J. ‎Spaans and P. ‎Larroy, "Linux Advanced Routing & Traffic Control HOWTO," August 2003. [Online]. Available: http://lartc.org/lartc.ps. A. Brown, "Traffic Control using tcng and HTB ‎HOWTO‎," ‎April‎ 2006. [Online]. Available: http://tldp.org/HOWTO/Traffic-Control-tcng-HTB-HOWTO/index.‎html‎. J. L. Valenzuela, A. Monleon, I. San Esteban, M. Portoles and O. Sallent, "A hierarchical token bucket algorithm to enhance Qos in IEEE 802.11: proposal, implementation and evaluation," in Vehicular Technology Conference, 2004. D. Ivancic, N. Hadjina and D. Basch, "Analysis of precision of the HTB packet scheduler," in Applied Electromagnetics and Communications, 2005. ICECom 2005. 18th International Conference on, Dubrovnik, 2005. M. a. d. Devera, "HTB 3 performance compared," [Online]. Available: http://luxik.cdi. cz/~devik /qos/htb/htb3perf/cbqhtb3perf.htm. R. G. Garroppo, S. Giordano, S. Lucetti and G. Risi, "A comparison of HTB based Channel-Aware Schedulers for 802.11 systems," in Wireless Internet, 2005. Proceedings. First International Conference on, 2005. "QoS-aware hierarchical token bucket (QHTB) queuing disciplines for QoS-guaranteed Diffserv provisioning with optimized bandwidth utilization and priority-based preemption," in The International Conference on Information Networking 2013 (ICOIN), IEEE, 2013, pp. 351-358. A. Kumar, S. Jain, U. Naik, A. Raghuraman, N. Kasinadhuni, E. C. Zermeno, S. C. Gunn, , J. Ai, C. Björn, S. M. Amarandei, M. Robin, A. Siganporia, S. Stuart and A. Vahdat, "BwE: Flexible, Hierarchical Bandwidth Allocation for WAN Distributed Computing," in Proceedings of the 2015 ACM Conference on Special Interest Group on Data Communication, ACM, 2015, pp. 1-14. "Manual: HTB," MikroTik. [Online]. [Accessed 15 March 2011]. www.ipoque.com, "Bandwidth Management Solutions for Network Operators - White Paper," 2008. [Online]. Available: http://www.ipoque. com/sites/default/files/mediafiles/documents/white-paper-bandwidth-management-operators.pdf. Y.-M. Wang, Y. Luo and Z. Hua, "On the extent analysis method for fuzzy AHP and its applications," European Journal of Operational Research, vol. 186, no. 2, pp. 735-747, 2008. ع. آذر و ح. فرجی، علم مدیریت فازی, تهران: موسسه کتاب مهربان نشر, ۱۳۸۶. س. م. زنجیرچی، فرآیند تحلیل سلسله مراتب فازی, تهران: انتشارات صانعی شهمیرزادی, ۱۳۹۰. O. Gogus and T. O. Boucher, "A consistency test for rational weights in multi-criterion decision analysis with fuzzy pairwise comparisons," Fuzzy Sets and Systems, vol. 86, no. 2, pp. 129 - 138, 1997. Himanshu, "10 reasons why people use internet," 4 Novenmber 2009. [Online]. Available: http://www.blogtechnika.com/10-reasons-why-people-use-internet. [Accessed 1 June 2011]. R. Kraut, V. Lundmark, S. Kiesler, T. Mukhopadhyay and W. Scherlis, "Why People Use the Internet," Human-Computer Interaction Institute, [Online]. Available: http://homenet. hcii.cs.cmu.edu/progress/purpose.html. [Accessed 10 January 2011]. "Daily Internet Activities," Pearson Education, Inc, 2008. [Online]. Available: http://www. infoplease.com/ipa/A0921860.html. [Accessed 1 June 2011]. T. Demirel, N. Ç. Demirel and C. Kahraman, "FUZZY ANALYTIC HIERARCHY PROCESS AND ITS APPLICATION," in FUZZY MULTI-CRITERIA DECISION MAKING -- Theory and Applications with Recent Developments, vol. 16, Istanbul, Springer, 2008.